This is a photo we took three or four years ago at work. We tried a few with sunglasses and some without. I think our manager used it in some marketing or intracompany communication presentations, with the caption, "Don't hate us because we're pretty." 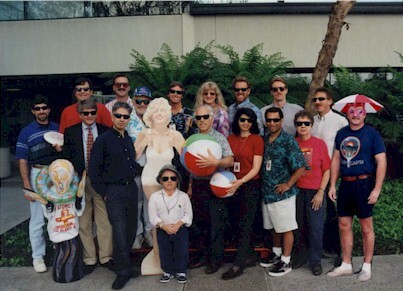 See if you can figure out which person was inserted into the photo with a computer. Hint: It's not Marilyn Monroe, or the "Scream" blow-up doll.